Bell Helmets has announced the first winner is in the Bell Built program. 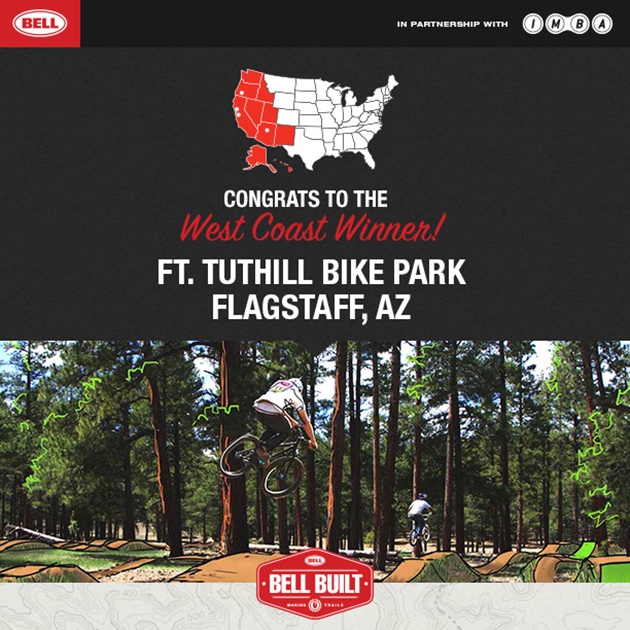 Out of the four western regional finalists, the Ft. Tuthill Bike Park in Flagstaff, AZ, rallied up the most votes and will be one of the three winning projects to split the prize in the 2014 Bell Built Grants: $100,000 in technical assistance money put up by Bell for three bike projects to be built in 2014 by IMBA Trail Solutions. The grant money will help fund the construction of the beginner and intermediate trails at the proposed bike park project, which will be open to the public for the entire mountain biking community to enjoy. Fort Tuthill Bike Park will be a fully-featured mountain bike skills park at the Fort Tuthill County Park in Flagstaff. The proposed skills park will contain a wide array of progressive features to appeal to all levels of bike riders. The park will be free, open to the public, and available for competitive events and skills clinics, utilizing the IMBA Bell Built Grant to implement the intermediate, and potentially beginner and flow trail features. The voting for the Central regional finalists is now live. You can view (and vote for) all of these projects, check out their video and info, now on the Bell Built site. Bell Bike Helmets and the International Mountain Bicycling Association (IMBA) Public voting to choose the winners began April 7 and ends May 18, with winners announced May 19. The project that receives the most votes from each of the two remaining areas above will win one of the three Bell Built grants. Any combination of trail types (pump track/bike park, flow trail, DH/gravity trail) may receive the grants. + Visit IMBA’s Vimeo page to see footage of the 2013 grant winners.